No one can say aluminum windows are boring! With many options for sizes and shapes, aluminum can go above and beyond the norm and show up as something fantastic. Large windows like this one can be easily created of lightweight aluminum, which makes installation easier. The glass itself can be single-pane, double-pane, or even security panes, or glass that shatters into one piece rather than falling apart into shards. 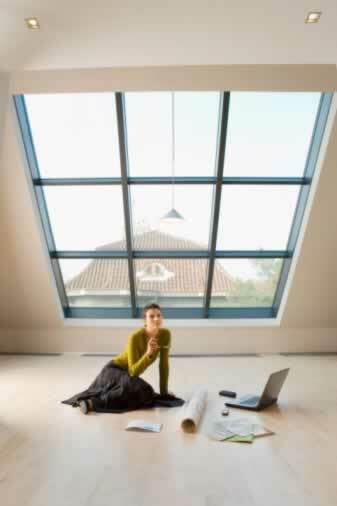 This is especially helpful for aluminum windows at odd angles, including aluminum skylights. Beyond the obvious energy savings that aluminum double-pane windows can provide, the versatility of aluminum doesn't stop there. You can opt for a baked finish at the factory, or paint aluminum in the colors your imagination loves the most. Another reason aluminum is so attractive for larger applications is the cost, aluminum can cost substantially less than wood windows or even vinyl windows. The price is definitely right with aluminum windows!